You may or may not be lucky enough to still have that svelte athletic body of your youth but just maybe you’ve put on some pounds over the years; maybe you’ve had some sports injuries or been in a car wreck that have left you with physical limitations; maybe you’re in a job that is tremendously time-consuming and stressful – and because of any of these reasons, you’ve given up regular exercise. Now what do you do to get back in shape? Try swimming. The reason swimming is so beneficial to people of all fitness levels is water’s buoyancy. It cushions stiff joints and delicate bones that have taken the brunt of hard exercise and play. In fact, your body is supporting only 50 percent of its weight when you’re immersed in water to your waist. That number rises to 25-35 percent when you’re immersed to your chest, and when you’re literally in up to your neck, your body is only supporting 10 percent of your weight. But what if you just want to get back into shape? 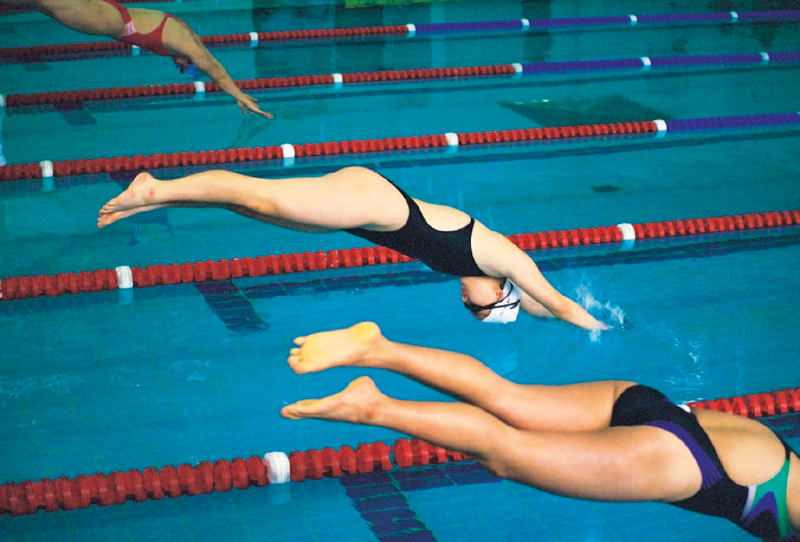 Swimming is still a great way to get fit, says Tay Stratton, head swim coach at the Little Rock Athletic Club. She notes that swimming uses all the major muscle groups that include the shoulders, back, abdominals, legs, hips and glutes. And because exercising in water provides 12-times the resistance of air in every direction, it definitely helps to build strength. Regarding your ability to lose weight by swimming, Robergs says that “research done on swimming showed that weight loss seemed more difficult. The theory is that the water submersion initiates a complex [nerve pathway] to lower metabolic rate.” That lower metabolic rate means that you’re using fewer calories. However, he goes on to say that these explanations need additional research and that if you follow the same principles of any exercise and challenge yourself, swimming can indeed be a help in losing weight. If you’re ready to dive in, experts recommend getting a swim coach or joining a masters swimming group in your area. Don’t let the “masters” designation scare you away – it simply means over the age of 20. The reason for joining a masters team is because it accommodates all skill levels, from beginners to advanced. They will help you learn technique (which in swimming is everything) and work toward building endurance, stroke efficiency and speed if you want to challenge yourself. You can also choose to swim competitively but you aren’t required to compete against other swimmers. All you really need to get started in terms of equipment is a comfortable swimsuit and a pair of goggles. Just get in the water, start to swim and feel the world fading away.